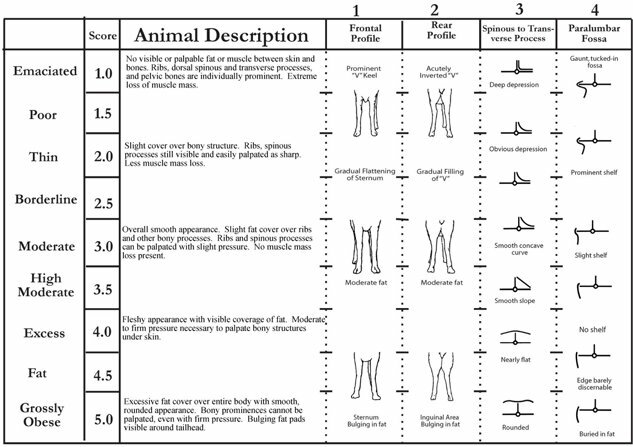 Body scoring is a way to describe the body condition of your llamas or alpacas through the use of a ten point scale. A score of five (5) indicates the animal is of average flesh. A score of ten (10) indicates the animal is obese and has had too many groceries. On the other end of the scale, a score of one or two (1 or 2) indicates the animal has an extreme loss of muscle mass. (Some charts, such as the one to the right, use a scale of only one to five (1 to 5). The body score is most commonly achieved by putting the base of the palm of your hand on the animal's backbone. In this position, laying your fingers down on the animal's side, you should find your hand at a 45 degree angle to score the animal at a perfect five. If the angle of your hand is more, score a 2-4, or even a 1 if extreme indicating a poor and thin body condition. If your hand is less than a 45 degree angle, you will have a score of 6-10 indicating your animal may be overweight. To reinforce your score, look at the animal's legs from the front and rear. The rear thighs of the animal should have an inverted "V" showing moderate fat. If thighs are touching, the animal is quite overweight. Body Scoring should be done on a regular basis and charted to manage your animal's health. It's especially helpful if you don't have a livestock scale to weigh your animals regularly. An animal's weight is not always a helpful indication of health unless you have charted weights on a regular basis. "Above right: Body condition scoring chart for llamas and alpacas (from Van Saun, R. Feeding the Alpaca. In: The Complete Alpaca, 2nd ed., Hoffman, E. (ed. ), Boony-Doon Press: Santa Cruz, CA, 2006). Refer to text for description of evaluation sites. The ideal body condition is 3.0, having a moderate amount of body fat. Although some individuals will maintain lower or higher body condition score and remain healthy, this is just inherent individual differences in metabolism. Body condition scores 2.0 and below or 4.0 and above are considered abnormal and represent extremely thin or fat animals, respectively. Most animals other than those in late pregnancy or lactation should maintain a body condition score between 2.5 and 3.25. Late pregnant animals should have slightly higher body condition (3.25-3.5) to have reserves to support impending lactation. Lactating animals will lose body condition rapidly as they produce milk. Lactating animals should not lose more than 0.5-0.75 condition scores. A loss in body condition implies the consumed intake of feed is deficient in energy, protein, or both. Important times to assess body condition score would be during early to mid pregnancy, early to mid lactation, and periodically (4-6 times per year) to other animals of the herd to assess energy status." The importance of forage quality to a nutrition program cannot be overemphasized. Forage quality is best tested by chemical measures for moisture, crude protein, and neutral and acid detergent fiber by a certified laboratory. Feed laboratories in your area can be found through the National Forage Testing Association (www.foragetesting.org). It is important to obtain a representative sample of the entire amount of forage to be fed using a forage sampling device. Visual assessment is based on identifying properties of maturity (i.e., stem thickness, flowers, seed heads), leaf-to-stem ratio, and foreign object presence. In addition to the chemical measures for quality, one should have macro- and micromineral content determined. This would allow one to best determine the need for additional supplements and evaluate which supplements best match their forage. Feed testing results will be in the form of a report listing nutrient content for the given sample. Generally laboratories will report nutrient content on an as fed (wet weight) basis and a dry matter (water excluded) basis. Dry matter nutrient content will always be the larger number as it represents the amount of nutrient in the sample without the water weight. In comparing nutrient content across feeds, one should use only dry matter values as feeds vary tremendously in their moisture content. Additional information about forage testing can be obtained from agronomy specialists with agricultural universities or extension personnel.